Since qualifying I have worked in both General Practice and Newcastle Dental Hospital, working in various speciality departments. In 2005 I completed my membership exams for the Royal College of Surgeons, Edinburgh. 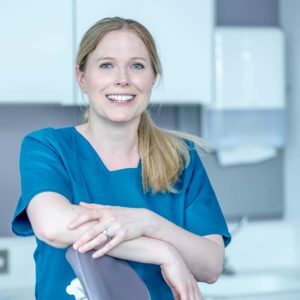 I enjoy building a rapport with my patients and find it particularly rewarding to help nervous patients overcome their fear of going to the dentist. Prior to marrying Mark in 2009, I decided I wanted to improve my smile for my wedding photos and underwent some cosmetic dentistry myself. I had my teeth whitened and straightened using invisible braces. I was very pleased with the results and enjoy being able to offer these treatments to my patients. Outside of work I enjoy playing competitive badminton, keeping fit, eating out and socialising with friends.